Anyway, you know the old saying “Be careful what you wish for. It might just come true”? Goll-lee. For the past few months, my husband and I haven’t gone on any dates. Things have come up, I’ve been sick, he’s been called in, and on and on and on. What finally came of it was our sitting together and saying, “We need to get outta here for an entire day -just us.” An hour or two away just wouldn’t cut it. Even the girl had joined our cause. “Mom you needa just go and take Dad and leave us here with someone.” Hear that? She’s ASKING for a sitter! She’s SICK of Mom and Dad! We wanted to do it before my husband’s surgery, but gueesss what? He’s been called in to work. And on. and on. and on. The day of surgery arrived yesterday. I called a sitter to come over at 5:30 AM so we could be to the hospital by 7 AM. Once at the hospital, my husband was checked in, checked over, stripped, stabbed with needles, covered with warm blankets, and made to feel as comfortable as possible. 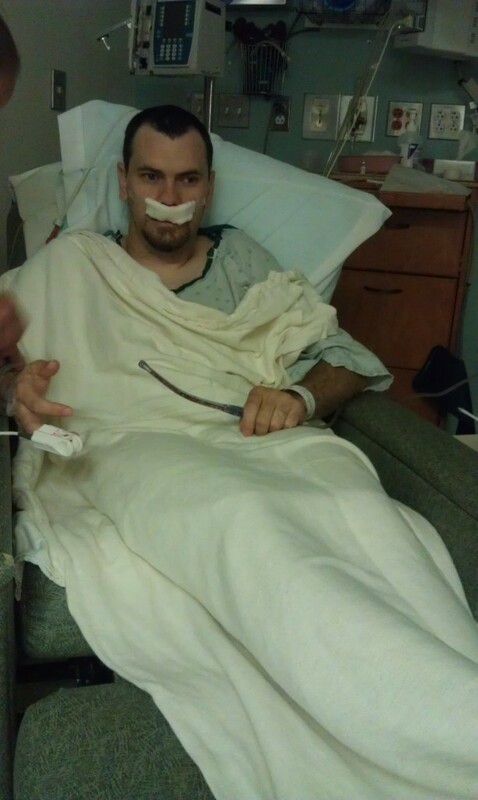 I sat by his side while they prepped him for his hour and a half long surgery to straighten his septum (inside his nose) and clean out a bunch of scar tissue and junk that had collected there over his 31 years (thanks in large part to allergies). Then the nurse asked me to kiss him and they whirled my very nervous husband away. I went to the cafeteria and ate Second Breakfast. Then I sat in the waiting room and typed up page after page of my great-grandmother’s journal. It was really strange, being alone. I had the ability to eat what I wanted whenever I wanted. I didn’t have to GET anything for anyone. I didn’t have to FIX anything for anyone. I just sat in a soft chair with my computer and typed, typed, typed. I ate an early lunch approximately 10 minutes before I’d be allowed to see him. I wanted to make sure that I kept myself full. I didn’t want to get sick while I had a patient on my hands. My cell phone rang. A nurse on the other line told me that he needed a little longer to come out of the Knock Out Juice. I wasn’t surprised. It always takes my husband a little longer. I should have anticipated it. 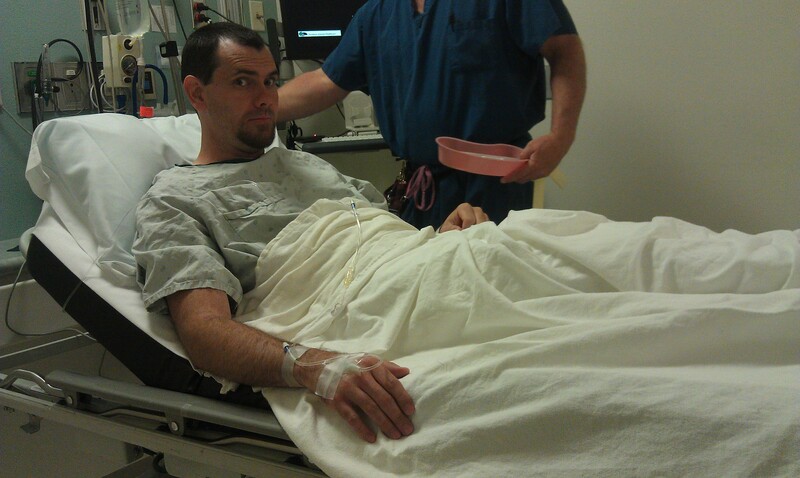 The last time he was knocked out for double hernia surgery, and the nurse was not even a little bit nice about it. “You need to sit him up,” she kept telling me. I finally got upset and told her that he WOULD. LATER. And that she needed to leave us alone for a while. It was refreshing to have a nurse be nice about it. His doctor came out and told me she had cleaned out quite a lot more than she had anticipated. She was genuinely concerned. There wasn’t really anything technical or mechanical about the way she spoke to me. She made it VERY clear that as soon as he healed up and was feeling better, he needed to get right back into her office to get his allergy problem under control. So we will, and it was really nice to see a doctor care. The call finally came that my patient was ready to see me. See the tube in his hand? It was a fancy sucking machine that he could put in his mouth and it would take the drainage that was invading his mouth and dispose of it in a quart-sized plastic tub… it was BLOOD. The quart-sized plastic tub was nearly full. And apparently it was the second one he’d filled. AND he was on his second fancy sucking tube. The other one got fully clogged. With BLOOD. I didn’t freak out. I just felt horrible for him. I rubbed his feet and made him laugh. I helped him get dressed, and I pulled the car ’round the front of the hospital entrance so I could load him in the passenger’s seat. We went to Sonic for some ice (and in my case Second Lunch), and then we went to Wal-Mart for some soft foods and ice packs. I was only in the store for a little while, I swear. But the car started heating up (it didn’t overheat) so my husband turned it off. And, like a dear, it refused to turn back on. So there we were, a man fresh out of surgery with strict instructions to NOT DO ANYTHING, a pregnant woman and a dead car in Wal-Mart’s parking lot. I popped the hood open. The air filter had fallen off. My husband tried to put it back on. I got angry with him and made him sit down. I called my brother and explained the situation to him. He began to ready the big tow truck to come and fetch us. I then called my Dad’s cousin who lived nearby and asked her if I could bring my bleeding husband to her house for an hour or two while we waited for the tow truck. While we were waiting for her to come and get us, a man came over and asked if he could help. “Yes!” I said, “Yes, if you can!” The man didn’t exactly look, well, “safe.” Not exactly someone you’d approach, I guess. “I just need to get this air filter back on, and I can’t. My husband just had surgery and he can’t…” I tried to explain. “No problem. Do you have a screwdriver?” I checked my car kit which is a safety tool equipped with lights and several tools… and ALL of the tools were missing. Of course they were. “No need to spend money,” he held up his hand. His friend made his way over with a penny, and they used that instead. He made sure we had someone coming to pick us up, congratulated us on our little one on the way, and then Anthony walked away. Within minutes, my Dad’s cousin was there. By some miracle (maybe Anthony was an angel?) the car STARTED. We carefully followed my Dad’s cousin to her home, took my husband inside to rest, and left the hood propped open to cool it off. And there we camped for over an hour. I called the sitter (who by this time had been with my children for over 12 hours), and I called my parents. I arranged to have my parents come and relieve our sitter, and after visiting with my Dad’s cousin and cutting up some potatoes so I didn’t feel absolutely useless… we were able to drive home without ANY problems. We even got to use our Air Conditioner. Even more miraculous? I didn’t get sick even once yesterday. Must’ve been all my Second Meals. I MIGHT be growing a Hobbit. Even MORE MORE miraculous? As we drove home and my husband had his head tilted back and I rattled on about this and that and we giggled and laughed, my husband spoke from just under the mound of gauze that was catching the drainage from his nose. “I had a lot of fun today,” he said, and then he spit blood into a cup. Gosh, it MUST be love. And we both hung our heads in shame. Well, not literally because I was driving and he had been specifically instructed NOT to hang his head. But our souls were dropping in shame. It looks like it’s time for us to change our ways. In the end we got an entire day away… no kids! After their bath and scriptures, we said our family prayers. Well, at least my husband and I will always have each other… even if the kids have had enough of us. PS: as we visited with my Dad’s cousin, my husband told her that I was a captivating story teller. You know that feeling you get when someone tells you you’re beautiful? Multiply that by one THOUSAND… and that’s the way it made me feel. He really knows how to get me. You sure know how to turn a fiasco into a fiesta. And I mean that in the best possible way. Also, Adam’s blood pressure was a million over a million when he had his shoulder surgery in ’09. Talk about a nervous man. this post made me smile. especially that very last part.